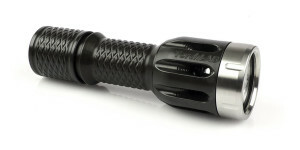 The INOVA T3R is a rechargeable tactical flashlight designed and built with law enforcement and professional use in mind. 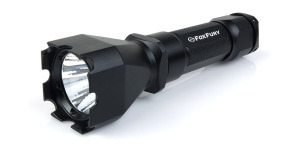 Equipped with built-in charging capability for its included lithium-ion battery, the T3R offers three modes of operation including a 234 lumen high mode, 20 lumen low mode, and tactical strobe. To simplify recharging when on the go, the T3R offers a number of options facilitated by its use of a standard mini-USB connector. A wall mounted AC charger and 12VDC vehicle charger are included with the light but it can also be charged using commonly available USB chargers used for phones or other devices. The INOVA T3R has a Manufacturer’s Suggested Retail Price (MSRP) of $119.99 and can be found at retail for around $100.00. The sample used in this review was provided by Nite Ize. The T3R arrives packaged in a cardboard box with the basics needed to put it in service. Accessories include the Lithium-Ion rechargeable battery, AC adapter, 12VDC car adapter, mini-USB charging cable, and lanyard. Measuring only 6.2” long and machined from solid aluminum bar stock, the T3R features a matte black hard-anodized finish for wear and corrosion resistance. The body and tailcap are each machined in a checkered pattern to enhance grip. Fit, finish, and machining of all parts is very nice with no defects observed. Unlike the body, the head of the T3R is machined smooth and completely free of features that could snag on clothing or a holster. This same smooth design also means the light is prone to rolling if placed on a smooth surface. Protection for the lens is provided by a thick aluminum bezel ring. 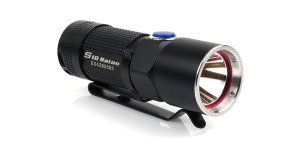 The mineral glass lens has a double-sided anti-reflective coating to minimize light loss from the Cree XP-G emitter. Output from the emitter is focused by a moderately textured machined aluminum reflector. An aluminum tailcap finishes off the T3R, providing a lanyard attachment point and housing the forward-clicky style switch. The switch is covered by a smooth rubber boot embossed with the INOVA brand name. The T3R can be “locked out” to prevent accidental activation by unscrewing the tailcap just over one-quarter turn. All three operating modes are accessed via the tailcap switch, with the T3R defaulting to its highest output mode when first turned on. If the switch is released and pressed a second time within 3 seconds, it will change to the 20 lumen low output mode. With the light off, a rapid double-tap of the switch will activate the strobe function. Each of the modes can be used in a momentary fashion with a partial press of the switch or constant-on with a full press and click. The tailcap is removable, allowing access to the proprietary lithium-ion battery. A spring-loaded brass button inside the tailcap is used to maintain contact with the battery. Threads on the body and inside the tailcap are anodized for wear resistance and an O-ring provides a weather tight seal. Due to the built-in recharging capability of the T3R, the tailcap and user replaceable 2200mAh battery normally would be removed only for replacement or to swap in a spare charged battery. Spare batteries are available from INOVA for $19.99. Twisting the head counter-clockwise 3-4 turns exposes the hidden mini-USB port and charging indicator light at the base of the head. The T3R can be charged with the included AC and DC adapters or any other USB source capable of providing 1A current. The indicator LED turns red while the T3R is charging and green once the charge is complete. Charging has typically taken less than 3 hours but a fully depleted battery may require up to 4 hours for a full charge. 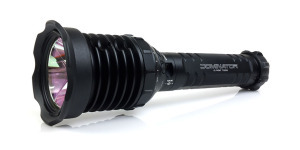 With its Cree XP-G emitter and textured reflector, the T3R projects a beam with a small but very noticeable center hotspot providing good illumination out to about 70 yards. The spill beam is smooth with tapering intensity toward the edges where it ultimately cuts off sharply. The beam is generally free of artifacts although there is a slight ring at the very edge of the spill beam. The following slides compare the INOVA T3R to other selected lights to provide a perspective of its output and beam profile. The beamshots can be compared across their full width using the slider and additional images can be viewed using the navigation buttons in the bottom-right corner of each image. Output over time was tested using the proprietary lithium-ion battery included with the T3R. The T3R demonstrated very stable regulation over the course of the runtime test, producing at least 95% of its initial output for more than 2.5 hours. Output began to decrease over the next quarter hour until the light shut off after 2 hours and 50 minutes of runtime. Heat during continuous operation is a non-issue due to the T3R’s conservative output. During extended operation the head becomes only slightly warm. The INOVA T3R has a nice appearance, durable construction and has been solidly reliable over the past 9 months. All threaded parts engage smoothly, the finish is still perfect and there have been absolutely no issues with operation of the light. Recharging has been easy and convenient whether using the included charging adapters, a PC’s USB port, or other USB power source. When compared to other lights in the same price and size range, the T3R seems like an underachiever with its 234 lumen maximum output rating, however, this is the secret to the nearly 3 hours of full output runtime provided by the INOVA. 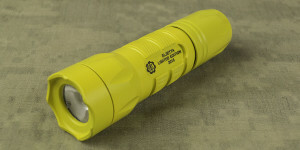 The design of any flashlight usually requires compromises between output and runtime and, in the case of the T3R, it appears the decision was made to provide a consistent level of output over a long period of time. The output is still more than adequate for illuminating small and medium-sized areas and provides the benefit of more time between charges. 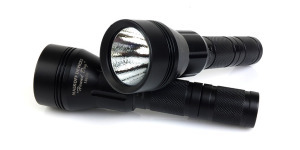 The checkered body and tailcap provide some grip advantage over a completely smooth light but grip is not as secure as on a light with conventional knurling. Also, the perfectly round design means the T3R is prone to rolling away if laid on its side. My overall impressions of the INOVA T3R are positive. It’s not the most powerful or “tacti-cool” light on the market today but instead it simply does what it’s designed to do, providing a consistent amount of light for a long period of time. A full line of accessories are available for the T3R, including colored signal cones, spare batteries, and a universal holster. The INOVA T3R is USA designed and engineered, with manufacturing in China. Visit the INOVA website for more information about the T3R and their other products. The INOVA brand is owned by Nite Ize, a USA company with its corporate headquarters in Boulder, CO.
Posted in Flashlight Reviews, Other Products and tagged LED Flashlight Reviews.